Voted 3rd best restaurant in the Caribbean by USA TODAY READERS CHOICE 2018. For the past 30 years, the food & atmosphere at Hibernia Restaurant & Art Gallery has reflected our experiences & annual Asian travels. Our location in Island Harbour means we have access to the best & freshest local sea food. "My cuisine has been described by some as eclectic but I would prefer the term personal. As a French chef, my respect for the French culinary values never fades and I enjoy blending them with my latest discoveries." This year’s journey took us to Myanmar, Cambodia , Bali, Thailand & Laos but our first stop was France for a wine tasting with our favourite winemakers. whose wines will be available in the restaurant but also for retail . Mary Pat will be happy to share her knowledge, to assist you with that special wine choice. In Asia, we search for Art to ship back but we also keep an eye open for new products & spices to incorporate into our new menu. From Cambodia we brought the world’s very best pepper from Kampot. On the Bolaven plateau of Laos we found coffee highly sought after by coffee lovers, with a production too small to export (we have only enough to flavour our ice-cream). In Myanmar, we discovered a new way of using tea. 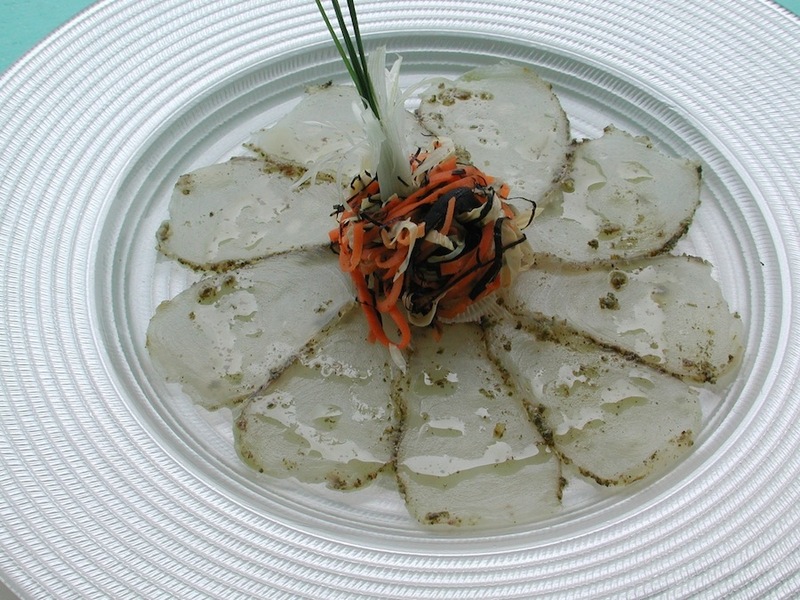 The leaves are pickled with chilies and served in a salad. We also discovered and bought some super healthy Sacha Inchi nuts and natural jaggery, for our newest ice-cream flavour. HIBERNIA RESTAURANT & ART GALLERY opened in 1987 when Mary-Pat & Raoul moved to Anguilla. "Since the purchase of the property in 2013, we have made extensive structural changes. The tables now border a Balinese-style water pool, nestled in a stone sculpture garden filled with dessert roses. We will always try to treat our guests to a most memorable meal. We can proudly say that everything served to you is hand-made in our kitchen. During your visit, enjoy wandering through the art gallery to browse our latest collection of paintings, hand-made silver jewelry & antiques". While keeping some of the favourites, Raoul continues to innovate with additional new dishes, reflecting influences from the annual three months of travelling. The art collection reflects our personal taste and is really anything that we find to be beautiful in any medium and every price range.